The Law Office of Glenn M. Wall is dedicated to providing its clients with quality legal services in the area of estate planning and probate law. Estate planning is NOT only for the wealthy. Clients of modest means have the same need to plan for the orderly transfer of their property after death as those with large estates. If you think you do not own very much, have you stopped to consider that your children are your most valuable "asset," and your desires regarding their care and control should you die are more important than anything else you leave behind? For this reason alone, estate planning is for everyone. Worried about costs? We are committed to providing you quality legal services at reasonable fees. And estate planning is not generally a recurring cost, because a properly drafted Will or Trust should last you a lifetime, even if your circumstances change. For clients with larger estates, we offer full estate planning services, including plans to minimize potential estate taxes through the preparation of bypass trusts, irrevocable life insurance and minor's trusts, and other related vehicles. We have extensive experience in drafting Wills of every type and nature, from the simplest to the most complex. We specialize in taking care of family needs, with Wills containing guardianship provisions and trusts for your children. In preparing every Will, we strive to take into account every contingency your family may face, so that you do not have to worry whether changed circumstances will render your Will obsolete or in need of revision. If estate taxes are a concern (and they will not be, unless your estate is worth over $5,000,000), we are capable of addressing those concerns through the use of a bypass (credit shelter) trust in your Will. We will also give you helpful tips on ways to reduce the value of your estate. A Living Trust is an alternative method of transferring your estate at death without the necessity of going through the probate process. Because probate is a relatively simple, "do-it-yourself" procedure in Georgia, we generally recommend Living Trusts for clients with more problematic estate plans, such as people with children from previous marriages and those owning real estate in another state. If you are interested in a Living Trust, we are capable of preparing everything from a simple trust for a single person to joint trusts for married couples with estate tax planning features. We can also assist you in transferring personal assets into your Living Trust, including real estate. Powers of attorney are an important part of any estate plan. A power of attorney allows you to appoint a trusted person, such as your spouse, to act as your agent to transact any business on your behalf should you become incapable of doing so yourself. Thus, if you become physically or mentally incapacitated or incompetent, your loved ones will not have to go through a potential guardianship proceeding, with its attendant costs and delays, to handle your affairs. We also offer statutory powers of attorney specific to health care matters, as well as living wills, to ensure that your medical wishes are carried out should you be unable to make those decisions. 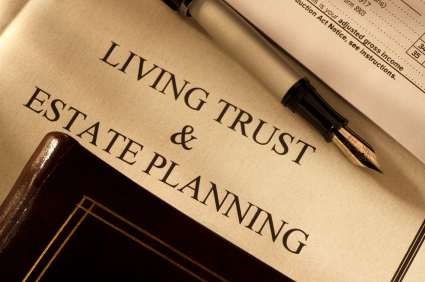 The estate planning process is relatively straightforward. You will begin by meeting with an attorney to discuss your individual needs and desires. The attorney will gather from you all of the pertinent information necessary to prepare drafts of the documents you want. You will receive these drafts by mail, usually within 10 business days of your meeting. You will be asked to review the documents for accuracy and discuss any changes with your attorney. When the final draft is thus complete, you simply schedule another appointment with the attorney so that he can review the documents with you, explain the meaning of their various provisions, and sign with the proper witnesses in attendance. Who do you want to leave your estate to? Of course, your spouse and children will probably be your primary beneficiaries. But have you thought about where the property will go if something happens to all of them? Would you want to leave your estate to grandchildren? A religious or charitable organization? Who do I want to serve as my fiduciaries or agents? This refers to the persons (or institutions) you want to serve as executor of your Will, trustees of any trusts, guardians for minor children, agents under your powers of attorney, and any alternates to those persons. Do I need to engage in any estate tax planning? This is a good time to determine your net worth by preparing a financial statement listing your assets and liabilities. This can be done on a computer program or written down on a sheet of paper, whatever you are comfortable doing. You may also want to bring along copies of deeds to real estate, account statements, or other records to give the attorney a sense of your individual circumstances. If you would like to discuss our estate planning services in more detail, or would like to make an appointment with an attorney, please contact Glenn M. Wall, attorney-at-law, at 770-932-4935 or by email at glenn@glennwallattorney.com.